COMPETING IDEAS MMS JANUARY 2018 26 mmsonline.com Manufacturing Management Practical Lean Although many "lean purists" may disagree with me, I believe that to be successful in the introduc- tion and implementation of lean concepts, a dose of practicality is required. I like to refer to this as "practical lean." Obviously, the ongoing elimi- nation of waste is the overriding objective of the lean concept, but there are a number of ways to achieve this. I prefer to see a lot of little successes along the way and believe in the adage, "Don't let perfect be the enemy of better." Here, I would like to share some of my experiences helping compa- nies get lean in a practical way. The Plant Expansion A very successful manufacturer of materials used in electronic devices was outgrowing its existing facility. The company was constantly adding new equipment to support its rapid sales growth, and this, combined with frequent process changes, cre- ated the need for more space. Located in a small industrial park, it had been increasing square footage incrementally by acquir- ing adjacent properties as they became available. At one point, the company had the opportunity to acquire a much larger space nearby. The challenge was how best to use this new space. The optimal approach from a lean standpoint was to reconfigure the entire production operation, streamlining flow as much as possible. However, there were concerns about such an approach, including: • The business was relatively young and much of the product technology was still evolving (existing designs were often pushing the enve- lope of what was possible). • Much of the production equipment was large, and electrical power requirements were very high, requiring complex configurations of power-generation equipment. • Although projections for continued growth were optimistic, they were just that: projec- tions. There were budgetary limitations estab- lished for the plant reconfiguration. With these concerns in mind, a practical-lean approach was chosen, and the "back-end" produc- tion processes requiring about 50 percent of the equipment were set up in the new space. 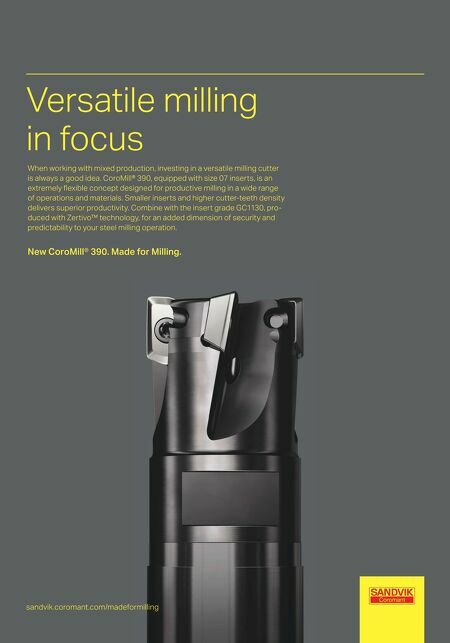 As much as possible was done to make these processes lean, and even though the overall production flow was not perfect, the company was satisfied with the results given its upfront concerns. The Plant Cleanup and Organization Effort A manufacturer of coated fabrics for automotive, clothing and bedding applications used a produc- tion process that generated a great deal of dust. As a relatively high-volume manufacturer, it was a challenge to keep the facility clean and organized. Over the years, var- ious types of environmental-con- trol equipment had been installed (at considerable cost), but dust was still prevalent. In a perfect operation, better production equipment, more dust-contain- ment devices and a rigid cleaning protocol might have mitigated the problem, but there was a need to produce 24 hours a day, seven days a week, and just keeping the equip- ment running required a considerable amount of labor. The practical-lean approach was to select one production line and make every effort to keep it clean and organized. This required training the line operators on 5S techniques and installation of localized dust-collection equipment. A concerted effort was undertaken to keep unneeded items, Adding a dose of practicality to lean implementations can increase the rate of employee and management acceptance. 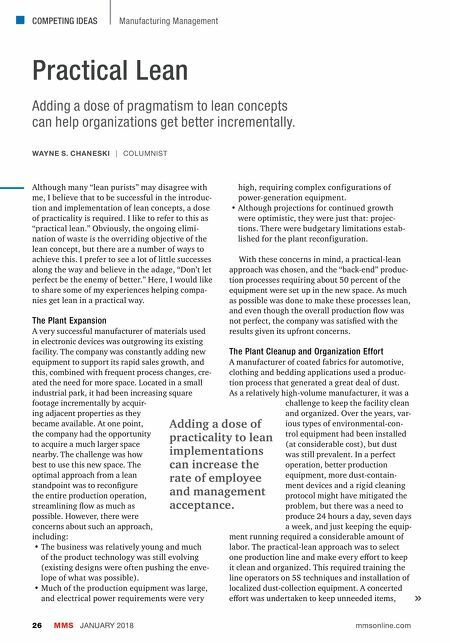 WAYNE S. CHANESKI | COLUMNIST Adding a dose of pragmatism to lean concepts can help organizations get better incrementally.